Each project is treated as another opportunity to build upon the dependable reputation the Mamais family has strived to develop over the last four decades. To achieve this, our project management team becomes involved during the planning stages of projects and stays involved until completion of construction. This ensures continuity between the preconstruction and construction phases, so that decisions made during the planning stages are properly implemented in the field. This seamless flow allows us to build and improve projects for our clients in a way that exceeds their expectations. Mamais Construction is committed to delivering the highest quality projects while meeting the expectations of the entire project team. The quality control process begins when the project is first awarded. For each project we assign a project management team to oversee every aspect of the project, from preconstruction coordination through close-out. This includes hiring only the most competent subcontractors, whose qualifications we diligently examine to support the efforts of the project. 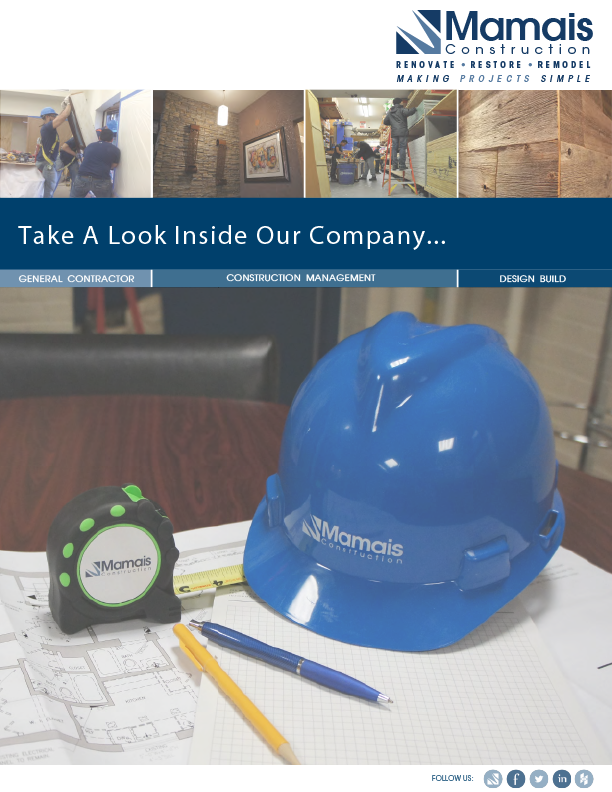 Throughout construction we make it clear to all employees and subcontractors that Mamais Construction is committed to quality and considers quality to be the most important performance measurement. At Mamais Construction we understand thorough planning is a critical step to running a successful project. Because each project is unique and each client has differing goals, we customize our pre-mobilization activities to reflect the specific needs of each project. Following the Contract award, some of our typical activities include; working closely with the Owner to establish a project timeline, reviewing project specifications to identify long lead items, assemble subcontractors and begin project coordination, prepare detailed construction CPM schedules, complete site safety planning and execution, gathering MSDS sheets and submittals, perform phasing analysis, and assessing Permit and utility coordination.